Spring and fall are common times for children to experience allergy symptoms. Runny nose, congestion, sneezing, itchy eyes and sometimes a cough can be signs that allergy season has arrived. Parents often turn to over-the-counter allergy medicines to prevent allergies or treat their children with these symptoms. The C.S. Mott National Poll on Children’s Health asked parents of school-aged children 6-12 years why they give their child over-the-counter allergy medicines, their experiences with those medicines and where they get advice about them. Overall, 55% of parents with children 6-12 years of age reported giving allergy medicine to their child within the past year. Of these parents, almost all (91%) gave these medicines to treat allergy symptoms, and around half (51%) gave them to prevent their child from having symptoms. Most parents (89%) used allergy medicines labeled for children, but one in seven parents (15%) gave their child allergy medicine that was labeled for adults. Of those using the adult medications, one-third (31%) gave their child the dose recommended for adults and two-thirds (65%) gave a partial adult dose. Overall, 21% of parents reported that it was hard to figure out the right dose of allergy medicine for their child. Parents frequently reported giving their child allergy medicines they already had in the house (85%) and also purchasing new medicines (74%). About one in five parents (18%) did not check the expiration date for medicines they already had in the house before giving them to their child. 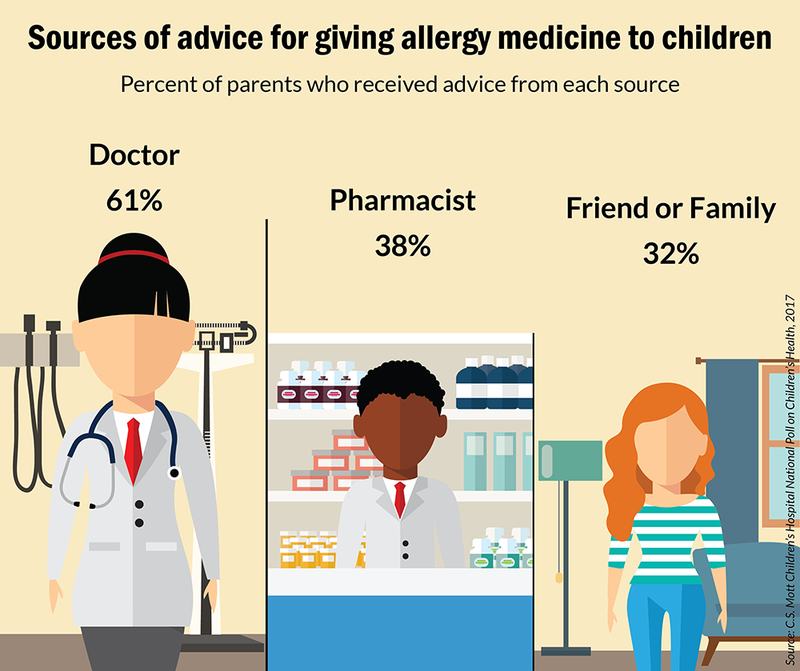 Parents most commonly received advice from their doctor’s office (61%) about which allergy medicine to give, but over a third (38%) got advice from a pharmacist. Fewer parents (32%) cited friends or family members as their source on which medicine to give. Only 21% of parents were aware that over-the counter-allergy medicines usually contain the same ingredients as cold medicines. Over half (55%) of parents gave their child over-the-counter seasonal allergy medicine in the past year. One in seven parents have given their child over-the-counter allergy medicine that was labeled for adults. One in five parents did not check the expiration date on over-the-counter allergy medicines they had at home before giving them to their child. Seasonal allergies are very common in childhood. Many children have only mild symptoms ranging from a runny nose and the sniffles to some sneezes, runny eyes and mild congestion. A smaller proportion have more significant seasonal allergy symptoms that can involve a severe cough, headache and more substantial congestion that can make breathing uncomfortable. Allergies tend to run in families - so if either parent has similar symptoms now or when they were a child, their children may be more likely to develop allergies. A small proportion of children may have symptoms so severe that they require prescription medication or allergy shots. For most children, though, parents can try to use over-the-counter medications to help relieve their child’s symptoms. However, they can be faced with a seemingly endless range of choices of over-the-counter allergy medicines, often without clear strategies of how to choose the best one for their child. In this situation, it is usually best to try to match their child’s symptoms to the medicines included in the product. For example, antihistamines can help with runny nose and itchy eyes while decongestants help with sinus congestion and stuffy nose. When looking at the choices available, parents should keep in mind that most store brands have the same medicine in the same dosage as name brand products. Also, most often over-the-counter allergy medicines contain the same medicines that are used to treat the symptoms of colds. By reading the ingredients on the box, parents can see which active ingredients the medicine contains and shop for the best price available. Over-the-counter allergy medicines, if taken as directed, are safe for children. However, as with all medicines, the potential for side effects exists. For the most commonly used over-the-counter allergy medicines, the most frequent side effect is the child becoming tired or sleepy. There are some over-the-counter antihistamines less likely to have this effect but they may be more expensive. Parents are then faced with the decision of whether the increased price is worth the potential reduction in side effects. Infrequently, allergy medicines can have the opposite effect and cause a child to have trouble falling asleep or to increase their activity. Unfortunately, there is no way to know in advance how a child will react so parents will have to learn by experience with each child. Some allergy medicines are packaged specifically for kids, specify the dosage information for children and may include a helpful measuring device in the package. Adult medicines usually contain the same ingredients but often do not have pediatric instructions. If using allergy medications packaged for adults, parents should be very careful to not give too much medicine to their child. Doses greater than recommended for children can result in more severe side effects. Parents often have allergy medicines in the house that are left over from previous years. Before using them, it is always a good idea to check their expiration date. Outdated medicines are unlikely to be dangerous but often lose their potency over time. In this Mott poll, parents reported most frequently that they ask someone in their provider’s office for guidance in navigating the choices. The next most common source of advice were pharmacists. Pharmacists can be a good source of information for medications but it is important to make sure they are aware they are giving advice for a child and to alert them to any other medications the child might be taking at the same time. This report presents findings from a nationally representative household survey conducted exclusively by GfK Custom Research, LLC (GfK), for C.S. Mott Children’s Hospital. The survey was administered in January 2017 to a randomly selected, stratified group of parents age 18 and older (n=2,001). Adults were selected from GfK’s web-enabled KnowledgePanel® that closely resembles the U.S. population. The sample was subsequently weighted to reflect population figures from the Census Bureau. The survey completion rate was 61% among panel members contacted to participate. This report is based on responses from 1,066 parents who had at least one child age 6-12 years. The margin of error is ±2 to 4 percentage points. Freed GL, Singer DC, Kauffman AD, Gebremariam A, Schultz SL, Clark SJ. Allergy medicine for kids: Dosing and labeling can be complicated. C.S. Mott Children's Hospital National Poll on Children's Health, University of Michigan. Vol 29, Issue 1, April 2017. Available at: http://mottpoll.org/reports-surveys/allergy-medicine-kids-dosing-and-labeling-can-be-complicated.